Panitrol XL pain relief ingredient matrix includes a blend of herbal extracts and active botanicals which have been clinically proven to support healthy joints while improving flexibility & mobility. 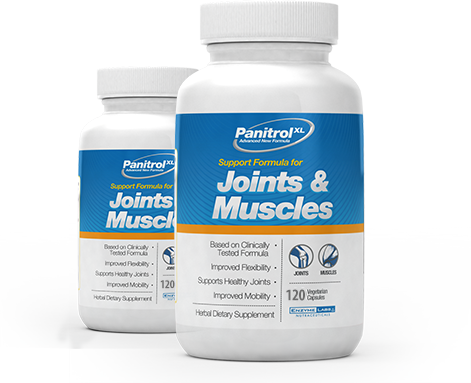 An added advantage of PanitrolXL is that it also keeps the muscles, joints, and cartilages lubricated to prevent the very onset of pain. spouse, or play a full round of golf, pain-free! muscle health, to prevent the very on-set of pain. in muscles caused by exertion and further relaxes them to eliminate muscle aches and pains. helps support the reconstruction of cartilage, the tough connective tissue that cushions to joint, restoring their health. long-term relief from chronic pain. Relieves pain, supports joint health, and flexibility to improve overall reach and mobility, enhancing daily activity levels. and lubricated, to prevent the very onset of chronic pain. 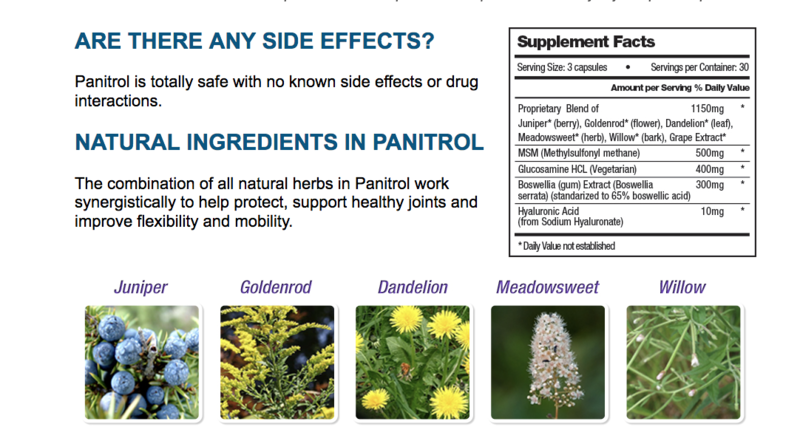 Panitrol XL's blend of ingredients works synergistically to support joint health and reduce body-wide pains & aches. Its double action formula works at a cellular level to eliminate the symptom & prevent the cause, simultaneously. Blocking the pain receptors in your brain that recognize pain, the symptom. Reducing Inflammation in your body, the root cause of all pain, the cause. which shows its effectiveness in eliminating pain, in just a few weeks*. *All content and claims may related to this product are based on personal user experience. Results may vary from person to person. Juniper reduces the chronic pain signals to the brain. It also closes leaky capillary paths reducing or cutting off altogether the source of the inflammatory substances and the plasma, which cause the “swollen” condition. A natural source of an Aspirin-like compound, it contains phytochemicals that relieve the pain of rheumatism in muscles and joints. Can provide additional joint support by lowering histamine levels and increasing production of a natural cortisone that helps with joint discomfort. Supports blood flow to the muscles, alleviating deep muscle soreness and spasms. “My name is Mario Henry, I was a former wide receiver in the NFL namely with the New England Patriots and Buffalo Bills. I had both of my knees scoped but I was still in constant agony, I could not bend down either. I decided to try a bottle of Panitrol Formula joint support. By the third day I was amazed I was getting out of bed without any problem and by the end of the first week was jogging with bounce on my knees. In the first 30 days I was running full speed and was getting strength back in my knees. 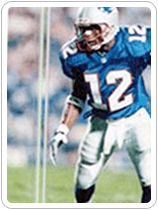 I tell everyone I know who has joint and muscle problems to try Panitrol Formula including other former NFL teammates. Thank you very much for getting me back to my life! 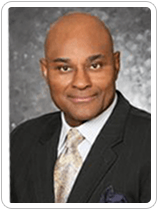 “I had severe back and knee pain from Football injuries suffered in the 70’s when I played in the NFL for the 49ers , Cardinals and Falcons. The Pain had limited my mobility and ability to enjoy working out . Thanks to Panitrol I am once again able to enjoy working out and exercising. Panitrol helps me do more physically when I am doing strength and Cardio exercises. My wife DJ is a Personal trainer and Fitness Coach and she loves the stuff. Thanks for enhancing our lives with this great product. I recommend this product to anyone who has joint stiffness or pain and wants to continue an active life. I'd like to take a moment to thank you for your Arthritis product, Panitrol. More than 20 years ago the joint pain and swelling in my hands was diagnosed as Osteo Arthritis and medication prescribed, but after time it caused stomach problems. I changed to glucosamine and chondroitin and have taken it ever since, but the symptoms have become more pronounced over the years. My husband uses one of your products to effectively manage his gout symptoms. He told me about and ordered Panitrol as a help for my arthritis. It arrived and the next Saturday morning I took the first dose of 4 capsules then began my usual routine of laundry, dishes, cleaning ... tasks which are especially hard on my hands and back. About 2 p.m. it hit me that my hands did not hurt or feel stiff. I did a 'double-take' after looking at them because my fingers were not swollen and I could close my hand into a complete fist! Of course I told my husband who could easily see the difference from a few short hours before. Now, I'm not promising others will experience the same results in such a short time. However, over the last 2 months the swelling in my hands and knuckles has remained reduced allowing me to wear rings which I couldn't get on for a long time. Both index fingers, which had turned inward, have 'straightened' out quite a lot. I not only feel better but also look better! My back is not stiff and achy upon waking in the morning - I can get out of bed much, much more easily. The joints in my toes are less swollen making my shoes and walking more comfortable. In 1968 I was buried in a trench when I tried to rescue another person. I had a damaged shoulder, left forearm and had sustained internal injuries and cracked ribs. For years I had trouble with my left shoulder and right ankle and was taking many different drugs for discomfort. I had surgery and as a result did not have to take anymore drugs for my injuries. I have to take OTC relievers for my daily discomfort and two months ago I tried the 60 day Panitrol challenge. At the time I started the Panitrol, I was taking six to eight capsules of a popular OTC pain reliever per day, and I was still in severe discomfort. Within four days of starting the Panitrol, I noticed a reduction in the level of discomfort and was able to get out of bed without severe discomfort and stiffness. I have been living discomfort free for the last two months thanks to PANITROL! For me PANITROL met the challenge!!! When I called today to order an extra bottle of Panitrol for my upcoming trip, I was raving about what a MIRACLE Panitrol was for me. Living most of my life with the discomfort of joint and muscle pain, having it for 45 years and I just celebrated my 60th birthday, I have literally been on nearly every drug that has come on the market over the years. Seems like each year I try the latest and greatest. You see, when you live with such discomfort, you will really try anything. That is when I read on the internet about the Panitrol Challenge. I thought, "Why not!" I tried it and felt good right away. More importantly I was able to get completely off my other prescriptions and as I still felt better and better. I was very worried that I would start to feel the discomfort from being off my prescriptions but still I feel great three weeks later. 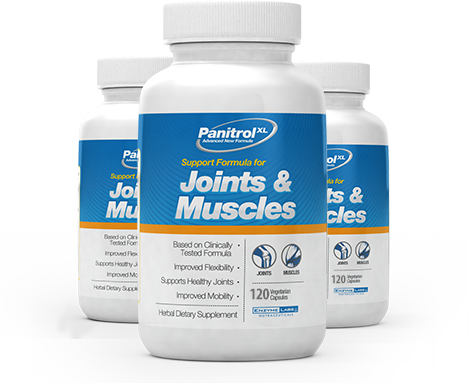 I am recommending Panitrol to everyone I know who suffers with joint and muscle discomfort, it truly is a Miracle Remedy. These statements have not been evaluated by the FDA. Panitrol XL is not intended to diagnose or guaranteed to treat, cure or prevent any disease. This product is not for use by or sale to persons under the age of 18. Before using this product, please consult with your healthcare professional if you are pregnant, nursing, diabetic, have any medical conditions or are taking any medications. 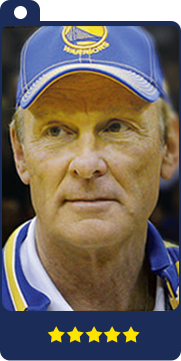 This website makes no warranties or guarantees, express or implied, as to the content, materials, services or products on this site, nor for the content of any links to or from this website, and the user agrees that the use of this site is strictly and solely the responsibility of the user. All products offered on this site are from certified third party manufacturers and are not manufactured by Panitrol XL. By using this site you agree to follow the privacy and all terms printed on this site. Void where prohibited by law. Results may vary. The FDA only evaluates foods and drugs, not supplements like these products. These products are not intended to diagnose, prevent, treat, or cure any disease. Click here to find evidence of a test, analysis, research,or study describing the benefits, performance or efficacy of Panitrol XL based on the expertise of relevant professionals."